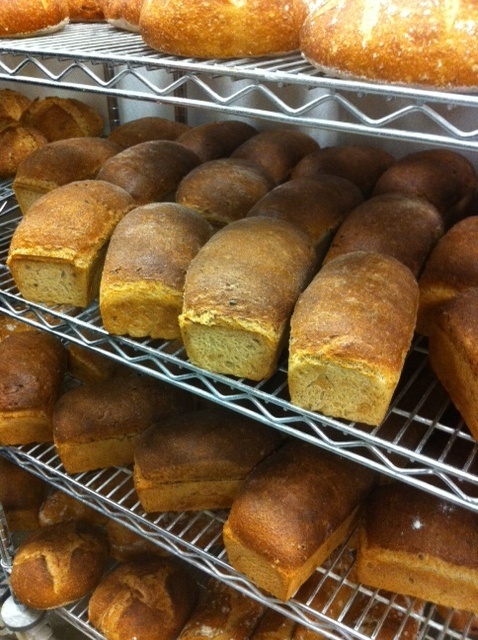 Last night I had the great opportunity to visit Hot Bread Kitchen, an inspiring nonprofit here in NYC. Hot Bread Kitchen’s mission is to create better lives for low-income women and their families, and they do this by teaching women the skills necessary to launch food businesses or achieve management level positions in the food industry. As part of their training, the women bake many kinds of breads that are sold in stores and markets around NYC and beyond. Importantly, the women are paid not only for their time in the kitchen, but also for their time in the classroom. I had read a lot about Hot Bread Kitchen in the past, so I was thrilled when a friend invited me to a volunteer night. We toured the space, sampled delicious bread, and got to work stickering and stamping packaging. In truth, I spend lots of hours doing similar packaging work for Baking for Good, but I was happy to put my experience (haha) to work for a good cause. Look for Hot Bread Kitchen’s products in stores and markets near you! This entry was posted in bakery, charities and tagged baking bread, baking for good, charity, hot bread kitchen, volunteering. Bookmark the permalink.